Bahamas with its capital Nassau is located in North America (chain of islands in the North Atlantic Ocean, southeast of Florida). It covers some 13,881 square kilometers (slightly smaller than Connecticut) with 329,988 citizens. English is the language commonly spoken used in Bahamas. This country shares no land borders with another country. The Bahamas (or The Bahama Islands) is an archipelago consisting of many islands. There are about 2,000 islands if you include the cays which are small islands that are formed on coral reefs. The word Bahamas is of Spanish decent and means Shallow Water. Several cruise lines operate private island retreats in the Bahamas. Disney Cruise Line owns Castaway Cay, Norweigan Cruise Line owns Great Stirrup Cay, Princess Cruise Line owns Little Stirrup Cay, and Royal Caribbean owns Coco Cay. To visit these islands you usually have to be a passenger on the cruise line that owns the island. Seeing as though the water is a big part of the Bahamas, it’s the perfect condition for water sports, kiteboarding, kayaking, deep-sea fishing, bonefishing, waverunners, island boat tours, wild dolphin excursions and even shark encounters. Averaging 80°F year-round, it’s like warm bath water. Bahamas' beaches are an attraction in itself but Bahamas is known for also possessing landmarks - explore them now. The landscape is long, flat coral formations with some low rounded hills. The average density of population is about 24 per km². The climate in Bahamas can be described as tropical marine with moderated by warm waters of Gulf Stream. Potential threats by nature are hurricanes and other tropical storms cause extensive flood and wind damage. To reach someone Bahamas dial +1-242 prior to a number. The local cellular networks are operated on 1900 MHz, 3G, 4G. Websites typically end with the top level domain ".bs". If you want to bring electric appliances (e.g. battery chaarger), keep in min the local 120 V - 60 Hz (plugs: A, B). The sign for the locally used currency Dollar is BSD. Lucayan Indians inhabited the islands when Christopher COLUMBUS first set foot in the New World on San Salvador in 1492. British settlement of the islands began in 1647; the islands became a colony in 1783. Piracy thrived in the 17th and 18th centuries because of The Bahamas close proximity to shipping lanes. 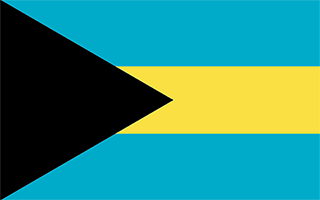 Since attaining independence from the UK in 1973, The Bahamas has prospered through tourism, international banking, and investment management. Because of its location, the country is a major transshipment point for illegal drugs, particularly shipments to the US and Europe, and its territory is used for smuggling illegal migrants into the US.